Once again, after celebrating each 10 year reunion up to the 50th, and then celebrating our 70th Birthday, 55th reunion, 75th Birthday, 60th reunion, 80th Birthday we are now ready to celebrate our 65th anniversary. Yes, we have gathered all those times! This may be the last hurrah. So please join us on Friday, June 22, 2018 at noon at Alioto's on Mayfair Road and/or Saturday, June 23, 2018 at noon at Asian/Am. Buffet and Grill in Menomonee Falls on Appleton Ave. Contact Barb Mitchell Kamermayer at 414/466-8085 for more info. We wil have rooms set aside for out of town guests and they have a van to and from the airport. Take a look at the announcement and download, fillin and mail the registration form with payment NOW! Where? The Downtown Marriott: 323 East Wisconsin Ave., Milwaukee. The hotel is centrally located for all the happenings downtown and at the lakefront. The free streetcar rides make it even easier to get around, especially as a stop will be right across the street from the hotel. Cost? $80.00 a person. This includes a buffet dinner and music and seven hours' worth of reconnecting with fellow 69ers. Details to follow in spring. For the Jan, 1969 class, Roger Gruebling: rgcamero4@aol.com is trying to locate you - please email him with your current email address and phone number. Please include any information of others that you are in contact with. 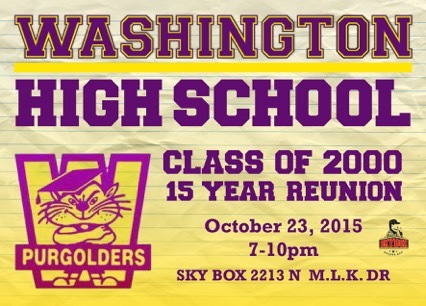 Are you a WHS (Washington High School) graduate? The 1970 class will be having their 50th anniversary in 2020. If you are interested in being part of the planning committee of this great event, please join us at the Ground Round Restaurant, 1005 South Moorland Road, on Tuesday, August 21st, beginning at 1pm. Please email rsvp to purgolders50@gmail.com. Or advise Cheryl Olmstead, Cathy Oakes, Dawn Harrison, or Barb Fadrowski on Facebook. We are looking for your updated street address, phone number and email address. If you are interested in being part of the committee please let me know. I have agreed to keep up the class information and help plan any possible future reunions. However, my class e-mail list was recently wiped out, and I am starting again. Please send me your e-mail address (prncpl@cox.net or prncpl@hotmail.com) and any others you have. This WHS website is wonderful and a great way to keep in touch. On my personal website < http://home.comcast.net/~prncpld/index.htm > is a section about our class with photos and bios. Scroll down the right side till you find it and then click on. 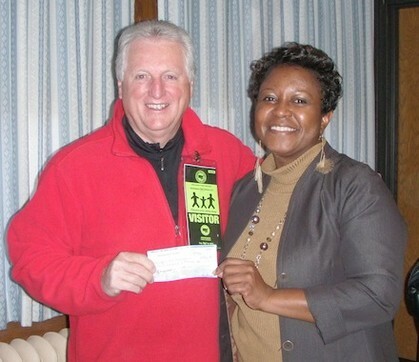 Recently, the Class of 1967 donated $700 to the Washington HS Alumni Scholarship Foundation. Mr. Richard and Lois Best presented this generous check to Principal Adair. We thank Mr. and Mrs. Best along with their 1967 classmates for their generosity. In the past months, each of these classes held energetic and fun reunions. As a result of their classmates coming together, each of these classes made a good-sized donation to the WHS Alumni Scholarship Foundation Fund. As you know this helps us to continue and even expand the scholarship opportunities for graduates of WHS. The announcement of the 2013 awardees is a result of the continuous support of our Foundation. Go Purgolders! The WHS Class of January, 1953 is holding its 60th reunion on Friday, June 14, 2013 at Alioto's, 3041 N. Mayfair Road ($25 each) and Saturday, June 15, 2013 at noon at Mama Mia's, 18880 W. Bluemound Road in Brookfield ($15 each). Download the Reunion Information and the Registration Form for much more information. Contact Barbara Pitt Vaitl at wvaitl@wi.rr.com for more information. Our class has a new fast-approaching event - our up coming 80th birthday being held on June 19, 2015 at noon at Alioto’s on Mayfair Road ($22/person) and Mama Mia’s on Bluemound at noon on June 20, 2015 ($15/person). Reservations end at the end of May. Contact Barbara Pitt Vaitl at wvaitl@wi.rr.com for more information and to make a reservation. Washington High School's January, 1958, graduation class will hold its 55th reunion on September 21, 2013, at the Venice Club in Brookfield, Wis.
Official invitations will be in the mail in early July. The class of 1962 is planning an informal get-together sometime on the weekend of Oct 22nd to coincide with the 100th Anniversary celebration. It will likely be on Friday evening Oct 21st. It will be an informal gathering for dinner at a local restaurant just so we can meet and greet and talk. Planning is just starting. Please contact any of the following 1962 WHS graduates to let us know that you are interested and might attend, so we can plan accordingly. If you are interested in helping out, also let us know. The class of June, 1963 graduating class would like to plan a reunion in 2013. We are looking for volunteers to help and information from former classmates. It would be nice to see each other again and to celebrate 50 years! Please contact www.milwaukeewashington100.com and click on the "Contact Us" to offer your help and make this a wonderful reunion! The site will put you in touch with other volunteers. We would like to get a committee together soon to plan a great event! The Washington High School Class of January 1965 will be having their 50th year reunion at Alioto's on August 15, 2015. Alioto's is located on Mayfair Road and Burleigh Street in Wauwatosa. Be sure to set that date aside if you plan to attend. Contact Peter Glaser, Lance Gruebling, or Audrey Schroeder Waylander for more details about the reunion. The class of June 1965 will celebrate their 50th reunion on August 7-8, 2015 Here is the flyer which was recently sent. (.pdf version) (.docx version). On Friday, August 7, 2015 Aliota's Restaurant, 3401 N Mayfair Rd, Wauwatosa for Graduates only. Saturday evening August 8th our event will be held in the beautiful Mount Mary University Alumnae Dining Room, 2900 North Menomonee River Parkway. Details on the Reunion Invitation here. Registration for the Saturday event is through www.ReunionDB.com. Further information is on the Reunion Invitation. To be part of our Facebook reunion site or if you have further questions, please e-mail Diane (Hait) Graham Pagenkop at dianegp@wi.rr.com or call 414-540-1161. The class of June 1966 will celebrate their 50th reunion on June 18, 2016 at the Woman's Club of Wisconsin. We are trying to make sure every class member knows about the reunion, so we are on the hunt for updated contact information,especially email addresses. You can help by checking our Current Missing Email List; to view it, just click on the link HERE. If you have email addresses for any of these classmates, click on the name and an automatically generated email will pop up. All you need to do is add their email address and hit send. Or you can forward any contact information to our class email account, whsclassreunion1966@gmail.com. SAVE THE DATE! JUNE 23, 2017 IS SET FOR OUR 50TH REUNION. The class of January 1968 45th Reunion is set for Saturday October 12, 2013 at the Charcoal Grill in New Berlin, WI. Please contact Sue (Klein) Richardson at suerich159@att.net with your contact information. The 50th reunion for All Classes of 1968 will be held on July 14, 2018 at the New Berlin Ale House. Invites will go out at the end of April. Or click here to view the invite/registration form. If you have any questions please contact one of us. The 1972 class will hold it's 50th reunion on August 18, 2012 from 5pm to midnight. The class of 1973 will be holding it's 40th class reunion at Mama Mia's on Burleigh, Saturday, September 14, 2013. Please fill out this form and mail it with your check to the address listed. We hope to see all of you on the 14th! Class of 1975 500 Month Class Reunion - Our Reunion event will be held at Minooka Park, Saturday, June 24, 2017 from Noon until 9:00pm. The park is located at 1927 E Sunset Drive, Waukesha, WI 53186. We are in reserved picnic area 3. The Class of 1975 40 Year Class Reunion will be held in Minooka Park in Waukesha on Saturday, July 18, 2015. Much more detail here. Please let one of the following members of the reunion committee know you are coming. Maria Ocampo (Eyers), Lynnette Thom and Kathy Filbrandt. Classes of 1978-1989 Group Reunion - A committee of WHS grads from 1978-1989 are having a reunion on Saturday, August 12, 2017 at Brown Deer Park in Milwaukee from noon - 8:00pm. There will be no cost, but we will have fund raisers to help with that cost. Click here for the fundraisers to make this happen free for classmates! Be sure to watch Social Media for more information. For more information, email whsalumnireunion@gmail.com or inbox Ricky McAfee, Tammy Vick, or Michelle Carr via Facebook!! This picnic will be BIGGER AND BETTER!! August 13, 2016 at Lincoln Park Picnic Area 1 from noon-8pm. Nostalgia II - 9316 W. Appleton Ave.
A photographer will be taking pictures the entire weekend. Photographer will take orders for a memory book which entails the entire weekend. Reunion t-shirts are an additional $5.00 Please indicate t-shirt size when purchasing tickets. T-shirts w/graduating year on them are only available for 1986-1992. Advance tickets sales will end on Friday, August 1st. Tickets will be sold at the door on Friday, August 8th & Saturday, August 9th. YOU MUST HAVE A TICKET TO ENTER EACH DAY! Contact Adrienne Lathan to purchase tickets and for further information. You're invited to our 20th class reunion (has it been that long???)!!!!!!!!!!!! Join us for the Main Event in a relaxed environment and atmosphere, where you can hear others and enjoy great conversation. Only this location has a large patio so you can sit an partake of some substantial appetizers from RCafe & Catering, while listening to the sounds of our old school DJ's inside or out. Please RSVP for this event (required) and if you'd like you can also make a donation! Catrina Crane and Propaganda Zilla Inc. / cZor Coffee / R Cafe / Roz Thurner LLC. October 23-24, 2015 at 7pm at Skybox Sports Bar and 5:30pm at WHS Fieldhouse.